We teach parents and caregivers how to support children throughout the recovery process and after they return home. Our program is designed for patients who experience difficulties that result from a brain injury or other related neurological conditions. We provide children and teens with individualized, progressive treatment plans to help them succeed and reach their full potential. In 2016, Children’s patients with traumatic brain injuries had a shorter length of stay than patients at similar pediatric facilities. 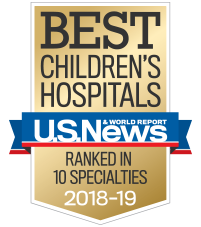 In 2016, Children’s discharged 97 percent of its patients with brain injuries to their homes, compared with similar pediatric facilities average of 90 percent.